An excellent script cannot make a perfect movie. But a talented filmmaker can make a classic even out of a cliched stuff. Amen is the most recent example. Lijo Jose Pellissery is a proven director. His previous works like Nayakan and City of God are enough to prove that. But Amen is a breakthrough. It alters all the familiar cinematic norms. Basic thread is a cliched love story. But the packing does all the magic. Amen ties Dante's medieval work's title, Divine Comedy with it and it is apt too. The whole story happens inside the Christian community in Kumarankery, a village in Alleppey. Solomon and Sosamma are lovers. Same old conflicts are there. The whole story is tied together using a peculiar musical instrument; Klarnet. It has an important part to play in the legacy of Christians in Kerala. Music has a vital role in this movie. All the songs in Amen bear the fragrance of the culture of Kumarankery. Abhinandan Ramanujam's visuals make the movie a spectacular one. One song in the movie is created using just a single shot. Camera is very live and always trying to capture something funny. In some scenes past and present are blended beautifully. Amen is really interesting because of its making. Each and every scene and characters are built in a different manner and presented with a novel tone. 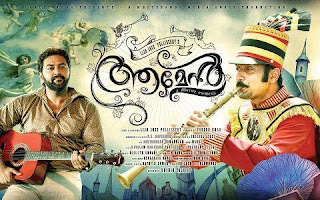 Fahad Fazil, Indrajith and everyone have made their roles memorable. Its a visual epic. Amen is certainly an epoch making film in the history of Malayalam cinema. A film with international standard in making. It really needs an applause. The verdict is clear. An excellent movie.